I woke this morning feeling awful. It’s Sunday, the day I usually hop out of bed, make coffee and get started catching up on what didn’t get done earlier in the week. You might wonder why it’s so strange for me to feel awful. It might seem weird that I’m sharing a story about how I feel when eating toxic food and why it matters to you? Trust me, you will want to follow along, it could save you from the pain and inflammation I endured needlessly. It all started back in February 2018. I accepted a 45-day challenge to change my bad habits, to start eating clean, stop the yo-yo dieting and take control of my declining health once and for all. How did I get to this place in my life? It’s really a long story, one that I’ll take you along on piece by piece. You see, my entire life, beginning in early high school I’ve always battled my weight. From my mom to grandma and her mom, all the women in my family are big-boned and overweight. I figured it was in my DNA, I was destined to end up looking and feeling just like they did. What I didn’t know was that the truth could be found right in my own DNA. We don’t know what we don’t know, right? I grew up eating fried meat, mashed potatoes or pasta, gravy or cheese-laden dishes along with some sort of bread. Rarely did a fresh vegetable grace our table. The fruit was a non-existent food because we simply didn’t have the money in the budget with five kids and two working parents. Consequently, when I got married and had kids I began cooking and feeding my family just like I had watched my mom feed us when I was young. That’s where the weight issues really started raising its ugly head and how back in February I made a choice to make some drastic changes including eliminating toxic food and begin clean eating. 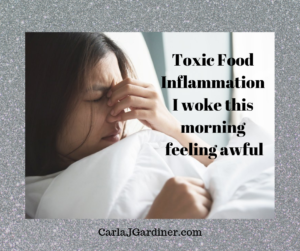 So, if I made those changes yet woke up Sunday morning swollen from the inflammation, aching in every joint in my body and a raging headache…what happened? Hubby and I decided to go out to eat at our favorite Mexican restaurant. We don’t eat out often because we can’t control how it’s cooked, what the ingredients used are or the portions served. However, we decided that one meal wouldn’t hurt and surely we were entitled to a treat. We even splurged and each ordered a small beer to enjoy with our meal. Seems easy enough, doesn’t seem like a real cheat, toxic food or bad way to eat, right? What I found was that although the meal in and of itself wasn’t horrible it contained some of the toxic foods that my genetic makeup doesn’t respond well to. That beer I thoroughly enjoyed? It is made from wheat, a grain that causes extreme inflammation in our guts. I didn’t have to EAT a slice of wheat toast to get sick, the grain in the beer was enough to push my system over the edge and into extreme inflammation. I didn’t pay attention to the guidance and education I had in the past twelve months and the result was 48 hours of excruciating pain. I’ve never felt so bad, not even in my younger, partying days have I ever been so sick from muscle and joint aches to the throbbing headache and stomach cramps not to mention the many trips to the bathroom. If I can share and pass along one piece of advice it would be this – once you make a decision to eliminate toxic food and start eating clean, to use customized supplements specifically for you and your health…stick to it. “Cheating” even so much as a little will undo all of the good you’ve done by clean eating. It can take you several weeks to clean up your body’s system and return to feeling awesome, energetic and sleeping well again. My friends…if you are wondering what I mean by “clean eating” send me a message, I’ll share. Meanwhile, share this, don’t let your loved ones and friends eat their way to inflammation, pain, and sorrow, it’s simply not worth a few moments of pleasure. Carla, you have some great points here. Although I don’t eat “clean”, I cannot eat wheat either. It really messes with my stomach. Congrats on your weight loss and keeping it off! Thank you, Livvie. Many people don’t eat clean but recognizing what is causing many of our health issues might spur us on to investigate the alternatives. The difference in my health in just one year is what has prompted me to return to educating men and women alike. I’m thankful you recognized wheat is not good for you…so many safer alternatives. Congrats on a healthy tummy!